Book Links’ Travelling Suitcases are filled with interesting and curious keepsakes from five of Queensland’s top children’s book authors and illustrators as well as a new case for Australian Children’s Laureate 2014-2015, Jackie French. They include some of their books; edited manuscripts and a DVD of the creators at works. 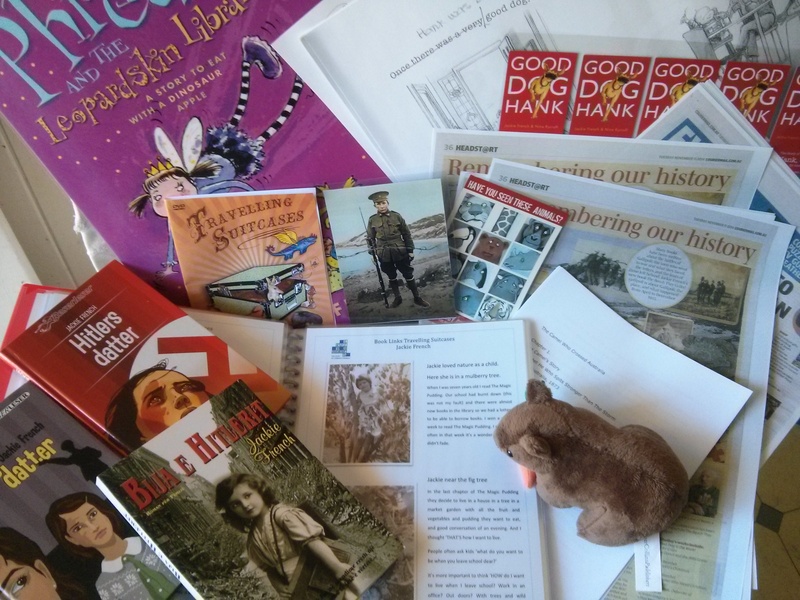 Activities to use in the classroom and in public libraries are included to extend Literature and Arts learning. The Travelling Suitcases will be of particular use to regional, rural and remote schools, and public libraries who have limited or no access to visiting authors and illustrators. They are free to borrow. The Ipswich District Teacher-Librarian Network. Each suitcase can be borrowed for 5 weeks. It is free, but each borrower is required to pay the forwarding postage to the next borrower or the Book Links office. “The Travelling Suitcase Wooloowin State School borrowed from Book Links provided a great stimulus for our focus on Australian author/illustrator, Gregory Rogers. In our busy curriculum there are not always opportunities to do author/illustrator studies, so I have a corner in our library where I set up “Spotlight on…” displays for a number of weeks. These displays are used to focus on and draw attention to a particular author and/or illustrator. It is an opportunity to promote this author/illustrator’s work. The Gregory Rogers Travelling Suitcase provided all manner of display signs, books, DVD and realia which enhanced the display greatly. Once I had introduced the display to students, they were able to watch and ‘meet’ Greg Rogers via the DVD which was set up on a laptop for students to access before school and during lunch hours. Students were able to read his books, play a game, leaf through display books containing copies of Greg Rogers’ rough drafts and storyboards and handle realia related to the craft of illustration. Students enjoyed interacting with the display – it was something different. Travelling Suitcases are a wonderful resource which are freely available to borrow (excluding postage costs) by all schools. Teacher Librarians know that time is a precious commodity which few of us have much of, so when a resource like Travelling Suitcases comes along (where someone else has done all the hard work of collating all the items) , I can’t but highly recommend it to all libraries”. So sorry for the delay getting back to you Bernadette – we’ve had a change of ‘Blog-sitter’. The suitcases are ready to go, and indeed some are already out and about. I will get the bookings person to contact you directly. Again, apologies for the delay. Can you tell me whether we can borrow the suitcases even if we are in Victoria? They look great! What a fabulous idea! Thanks for the kind words Leanne, but sadly, I’m afraid we can’t send them out of Queensland. The suitcases are such a good idea that demand in Queensland is going to keep them busy for a long time yet. Sorry I can’t be more helpful.